Oh how I love St Tropez! What a fabulous place! You have vineyards and villages, a romantic town, a gorgeous seaport, fantastic shopping, great restaurants and an incredible beach! St. Tropez has everything one could wish for in a vacation spot. We drove the coastal route from Provence down to Marseilles and on to La Croix Valmer and sneaked into St Tropez via the back door. It was a wonderful drive! We arrived at our hotel La Ferme D' Augustin on the Plage de Tahiti in the early evening. This small and sweet property is within walking distance of Tahiti beach. We had the smallest rooms in the house, but the terraces, the lounge areas and the pool area more than made up for the lack of space. We dined very lightly that evening on appetizers. After the large luncheon we had enroute we were not terribly hungry. And of course we had to try the Cote de Provence Rose. No where else in the world will you find any wine so fine! The following day we continued our villa visits. 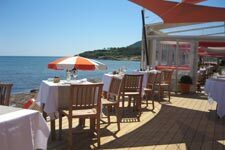 We visited 9 villas and had a fabulous lunch at Tropicana on Pampelonne at route de Bonne Terrase. What an experience! It was so beautiful and the food was fabulous! The best Steak tartare ever! Some great villas that we saw included AZR 312 near St Tropez harbor. This is a 6 bedroom villa and the location is killer! Great views!! Villa AZR 375 in Gassin, is like a palace! Only 4 bedrooms but everything is PERFECT! The interior is all beige and white and a little over the top, but Americans would love it! My other favorite is AZR 335 which was still under some construction when we visited. It's located on the Blvd Patch just 2 or 3 villas from the beach - what a location! This villa is very modern and somewhat minimalist, with a large lap pool and a gorgeous garden. Then for the client that wants the best villa in the area (not near the beach, but a short drive) there is AZR 309 (call for information) at E 55,000 a week! This villa is incredible with a pool that has a built in swim up bar, a shallow pool for children, a built in Jacuzzi and the rest of it is freeform. And the view is amazing! This villa reminded me a lot of the best villas in St Barts. Another recommended villa is CCV SOU which is a 6 bedroom villa with its own helipad and tennis court. 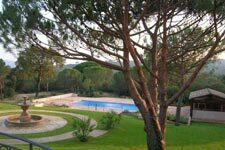 It is surrounded with park-like grounds and located just of the Route de Plages near the road to Nikki Beach. Anyone would love this villa. We enjoyed a fabulous lunch at a restaurant on the Place des Lices. The trees had not yet put forth their leaves so this Parc looked really strange. It was my first exposure and I still cannot get over how the French prune and shape their trees. ACV FAB is one of the nicest houses we saw in the St. Tropez area – incredible artwork - including one room with a diesel engine from a motorboat and chairs made from the exhaust pipes. It has fabulous views of l'Escalet beach – the last undeveloped inlet in the area and you can walk down to the beach in 5 minutes. There is a huge pool deck and large, saltwater infinity pool. The master bedroom has a Corbusier couch and panels from the Atomium in Brussels. The amazing home theater uses Klieg lights as decoration. Guests will enjoy the wonderful décor, lovely outdoor seating areas, and the great kitchen with second staff kitchen behind. The St. Tropez area is beautiful – on the Med with vineyards, countryside, beautiful homes and close proximity to the town of St. Tropez and the hillside towns of Ramatuelle, Gassin and Grimaud. We visited in May and the crowds were small – July and August must be very busy – traffic is supposed to be difficult then and we were told it is hot – seems like the best time to go is May-June and September-October unless you want to see and be seen. The friendly South of France offers so much for anyone - the beauty of the Alpilles and Luberon areas of Provence are perfect for those wanting to relax, savor the food and wine, shop for local crafts and antiques, and tour the many historic treasures of the region, which include medieval castles and hillside towns as well as Roman aqueducts, ruins, coliseums and theaters. 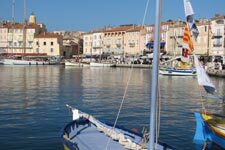 And the St. Tropez area has lovely countryside and historic villages plus the beaches, harbor, upscale shopping and nightlife.